for it. Normally a retailer will be happy to throw in a free mouse pad with another purchase, if you ask, especially if it is imprinted with advertising of any sort. With optical mice, you want as slippery a mouse-pad surface as possible to give you fine control of mouse motion. You also want something with an intricate, variegated, micro pattern (not a solid colour) to give the optics something to notice moving. Game players particularly go in for fancy mouse pads to get every last drop of control. Modern mice are not as picky about the surface pattern. I was puzzled why nearly all high performance mouse pads are solid black. You’d think you would want a black and white micro grid or millions of tiny coloured dots to create a tracking pattern. I think I solved the mystery by peeking under my mouse at the way light reflects off my new black mousepad. The surface feels smooth, but it is actually pebbly, with millions of very tiny bumps and grooves. The red LED (Light-Emitting Diode) light reflecting off it forms a fine network of thin spidery bright red lines. The lines form where the angle of the surface is just right to reflect light back. This is just what the sensor needs, an intricate, high contrast pattern to track. The black helps enhance the contrast. On the other hand, my Logitech M310 mouse definitely prefers a light surface, even a plain white surface. On a darker surface the cursor moves very slowly. It does not seem to notice it is moving. Silk-covered (not silk-screened) cloth pads are very slippery and don’t wear the mouse feet off so quickly. Ideally you want to try out a pad with your own mouse before you buy. Which kind of mousepad is best for for each kind of mouse I do not know, however, I suspect expensive black mousepads are intended for expensive red laser mice. Infrared mice must have a light-coloured mouse pad. They will barely work with a black one. 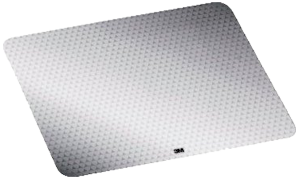 I have ordered light 3M mouse pads with micro-patterning for our Logitech M310 and M325 mice. but they have not arrived yet. Here is a sampling of premium mouse pads, smallest first. Visit the various manufacturer websites to see their complete lines. CurrCon Applet needs Java 1.8 or later to display prices in your local currency. Digitally printed with your choice of artwork from their galleries. This is an ordinary mousepad, not a high performance surface. The dimensions and price depends on the artwork you select. Granddaddy of the high tech mouse pads. Uses a microgrooved surface. Light coloured. Claims to extend battery life by 75%. Presumably mice are smart enough to turn down the power of the beam if they are having no problem tracking moving micro patterns. This is what I use myself. It works very well. It is a little on the small side. It is no thicker than a piece of stiff paper. The adhesive backing works perfectly, but I guess 3M has had some practice at that. Cloth surface. Danish company that makes over a dozen different models. Thinner than a credit card. Has a hexagonal honeycomb pattern. Only ship to the USA. black. Two sided. Gel rest. Designed for gaming. Can be rolled up. This is the mat the Xtracs Pad-o-matic computer program recommended I buy. However, I was looking for something more colourful. They only ship to the USA. Sleeps eight, ridiculously huge. For comparison, my anti static mat is only 60.96 × 58.42 cm (2 × 1.92 ft) and my entire desk surface is 1.47 × 0.74 metres (4.83 × 2.42 ft). It would cover 40% of my desk surface. I think they intend you also rest your keyboard on it. Cloth surface. Only ship to the USA. , but you can change that instantly, thanks to the Canadian Mind Products CurrCon Applet that you too could use on your own website to display prices in any world currency using today’s exchange rates. at the dollar store. They are not that impressive to look at, though the ads suggest buying one will turn you into a superhero and come with keys to you very own bat cave. I removed all links to Everglide. They seem to have gone belly up. Be careful to check shipping cost. It is often greater than the cost of the mouse pad. There is a lot of hype in the ad copy for mouse pads. The copy seems to be directed at teenage game players. Fortunately, even the poorest computer user can afford to buy the top of the line mouse pad and even if he paid way too much, he won’t be seriously out of pocket. I suspect most of these pads actually cost less than a dollar to manufacture. They would be much cheaper sold as desk protectors or placemats. However, compared with other computer expenditures this is a minor expense. Most of these companies also sell high performance replacement mouse feet called mouse skates or mouse skatez. The Xtracs people have a tool they call Pad-o-matic that asks you seven questions then rates their products in order to how well they meet your criteria. I wish every site had such a beast to help sort out all the models. I would add another question: What colours are acceptable? So many models come only in basic black. It suggested the Ripper XL for me. It is hard to buy a mouse pad over the Internet. You want to run a mouse over it to test the feel. Clean the mouse pad with pure isopropanol (aka rubbing alcohol) which you can get at the drugstore. You want the 99% pure kind without any added oils. Unlike nearly everything else in computers, pretty well any cleaner will do to clean a mouse pad, so long as it does’t leave a residue. It would be easy to clean. Spilling coffee on it should not hurt it in the least. It should be 30.48 × 38.10 cm (12 × 15 in), taller than it is wide. It should not have any corporate logos on it or pictures of naked warriors or space aliens. It should be yellow or orange. Alternatively frogs or tropical plants or fish would be ok. It should have a surface that lets me move the move the mouse very slowly and precisely, such as for working in PaintShop Pro — the place I most notice mouse stickiness and lurchiness. I don’t know what that surface looks like, whether it is rough or smooth, whether it would be glass, plastic, cloth or metal, but I would know it when I felt it. The bottom of the mat should stick firmly to the fake wood surface of my desk. The colours should not fade, even if exposed to sunlight. The colours should not wear off with use. I want them embedded, not painted on. I want it to be extremely durable. I want this mouse pad to last me the rest of my life. I get attached to objects I use all the time and it distresses me when they die. I would like to be assured the patterns on the pad are especially good for optical tracking and that these patterns will not disappear with use. I am puzzled why nearly all pads are solid black. This strikes me as the worst possible pattern. I am obviously wrong in my aversion to solid black and I would like to know why. The best pad in the world will not do you any good if your mouse feet are worn. Mousepad surface has micro stippling so the mouse can see a difference as it moves. Whatever the stippling/microgrove technology used, it must create a high contrast stippling. The mousepad surface should be a light colour, i.e. reflect lots of light of the frequency used by the mouse, usually blue, infrared or red. The mousepad surface to be slick, offering no resistance to the Teflon mouse feet. Oddly, sometimes surfaces that feel rougher to the touch can offer less resistance. Generally, the harder the surface, the less resistance though it may not be as comfortable. Unfortunately, you can’t take mousepads for test drive before purchase. Before you buy, Google the model and see what people who bought it thought. Also I have not even seen a mousepad for sale that lays claims to these ideals. The mousepad I received as a gift disappeared. I do a fair bit of single pixel work drawing and editing where I have to insert the text cursor between two small characters. Both require excellent mouse control. That requires the best possible mouse pad. Oddly, next to the screen, I clean my mouse pad most often. It gets slightly sticky from the sweat from my palm which interferes with fine control of the mouse. Every few days, I clean the pad and the bottom of the mouse with a squirt of home-made window cleaner. Be careful not to damage the feet of the mouse with are held on with just a bit of poor-quality adhesive. The blue food colouring is optional; it helps identify the sprayer contents as window cleaner. Use a microfibre cloth. Granddaddy of the high tech mouse pads. Light coloured. Micro textured to improve the accuracy of mice. It gives them a micropattern to detect motion. Claims to extend the battery life 75%. Presumably mice are smart enough to turn down the power of the beam if they are having no problem tracking moving micro patterns. It is quite small and thin. They have a vinyl smell and pebbly surface. The mouse make a zipper-like noise as it moves over the pebbly surface. At first the sound was distracting, but then I got used to it. Within 24 hours it had worn off the feet off my mouse, though it still moved easily. It has a tacky backing to hold it in place. The cursor moves very quickly, which suggests the surface is indeed optimal for detecting motion. The cursor moves all the way across the screen when when I move the mouse less then half way across the tiny pad, so the pad does not need to be as big as usual. It has no built-in wrist rest. This is what I use myself.